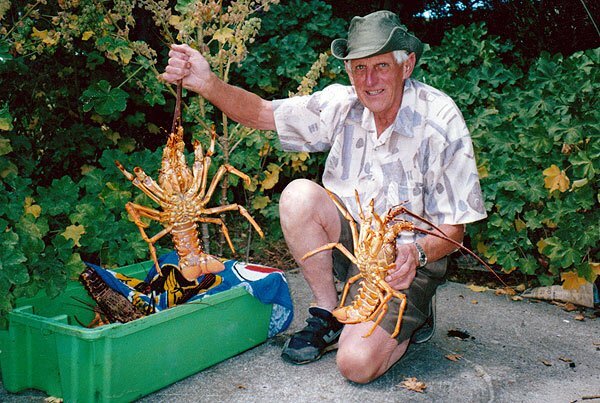 Allan Burgess with a brace of red rock lobsters from Kaikoura. Perhaps better known in New Zealand as crayfish they are excellent to eat and command very high prices in shops. Red rock lobster is also called: Koura papatea, crayfish, spiny rock lobster and rock lobster. Widely known in New Zealand as crayfish where it is considered a delicacy and fetches a high price. Live crayfish are exported overseas by air. They are caught both commercially and recreationally in baited pots. Crayfish are subject to strict quota and size limits. This species has been heavily fished, and over-fished, for decades. As a result, it is unusual to see rock lobster now that are much larger than the minimum size permitted to be taken. A friend of mine fished for crayfish off Fiordland in the 1950s. He has shown me photographs of the entire deck area of their trawler covered to the gunwales with large crays. There were enormous numbers taken at that time. However a few years later the fishery declined sharply. Many of the crays caught at that time would have been decade’s old breeding stock. The colour of the New Zealand red rock lobster is dark red and orange above and light yellow to orange underneath. The body is very spiny with the head area being particularly so. Females have small pincers on their rear pair of legs. They are quite slow growing and can take from 5 to 10 years to reach legal size. Red rock lobsters are found all around the New Zealand coastline from 5m out to a depth of 275m. They are generally found in coastal waters less than 100m deep. Rock lobsters are usually found on reefs but are sometimes found in large numbers well away from any shelter. Commercial crayfish pots are always set over foul ground. Here are a couple of really big crays! Rock lobsters are most active at night at which time they will leave cover in search of food and new places to hide. They return to rocky areas and hide in crevices during the day. Hence cray-pots are most effective if left to “soak” overnight. Crayfish move around throughout their life-cycle; females may travel away from structure out over open ground before releasing their larvae. Also, younger crayfish move from nursery grounds to breeding grounds. Crayfish also move into shallow water for moulting and may move around as food supplies ebb and flow. Red rock lobsters migrate around the sea floor and have been recorded travelling as far as 460 km. There are strict regulations concerning the gathering of rock lobsters which are enforced by the Ministry of Fisheries. 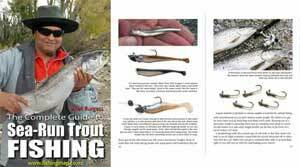 The ministry has produced a brochure which outlines the information recreational crayfishers need to know before they head out to catch them. The following are some of the main points you need to know. 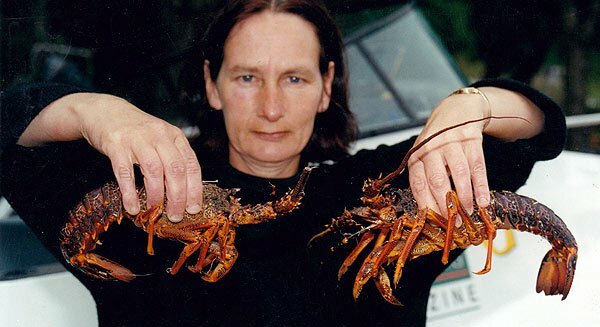 A .pdf version of the Rock Lobster brochure is available at www.fish.govt.nz. The regulations regarding the gathering of rock lobster change from time to time and it is up to individual angler/gathers to know the fishing rules. Most of the crays taken along the Kaikoura coast are just above the legal size like these. Occasionally a big one is found in a pot, but big crays are more likely to be caught by divers. Red rock lobsters may be taken only by hand-gathering or in pots. It is illegal to use any spear or device which could puncture the shell when taking rock lobster or possess any rock lobster which has been speared. You must also avoid grasping rock lobster by their legs or the antennae. Fishers must immediately return egg-bearing (berried) female lobster or any lobster in the soft shell stage to the water. Special care should be taken to return all lobster onto suitable habitat immediately so that mortalities from exposure to sun and wind, or attacks by predators as they swim to shelter, are minimised. It is illegal for recreational and customary fishers to sell their catch. Lobsters rapidly go blind in sunlight. Measure them as soon as they leave the water and quickly return illegal lobster to where they can find shelter. Pots should not be left baited and unattended for more than 24 hours. Octopus can enter pots and will kill any rock lobster that cannot escape. Individuals may use, set, or possess up to three rock lobster pots in any one day. Two or more individuals fishing from a vessel may use, set, or possess up to six rock lobster pots in any one day. There are exceptions for some areas and fishers should check either at a Ministry of Fisheries office or on the www.fish.govt.nz website. Most crayfish caught by recreational anglers are taken by diving. My eldest son is very good at getting crayfish just by swimming out into the surf near rocks. The advantage of this method is the ability of the diver to pre-check for size, and whether it is a female in berry, before returning to shore. The tail width is measured in a straight line between the tips of the two large (primary) spines on the second segment of the tail. The minimum sizes for red rock lobster are 54 mm for males and 60 mm for females. If a red rock lobster measures less than 54 mm for a male or less than 60 mm for a female, or if any part of the spines or shell on this segment is broken, the lobster cannot be kept and must be returned to the sea, immediately and unharmed. Crayfish are excellent eating. It is best to drown them first in freshwater. Then cook them in boiling salted water. The cooked flesh is white and firm. The tails contain most of the meat but there is also good eatable fleck in the legs which is removed by breaking them in half after cooking. I have had crayfish won tons on a fishing trip to Fiordland. This is a good way of serving one crayfish to a dozen people! It might seem like a silly trade-off but crayfish are an excellent and very effective surfcasting bait for crustacean feeding species such as moki and rig shark.